Spring is a time of change in Rockport, Texas; days get longer, nights get shorter, one day cold, next day hot, wind 30 mph from the north, wind 30 mph from the south. No wind, high tides, low tides, high pressure, low pressure…The possibilities and combinations are endless. Each day brings a new set of circumstances creating a dynamic weather pattern with very little consistency in the spring. This is much different than the dog days of summer where each day can almost be a carbon copy of the day before for weeks at a time. I sit here and write this surrounded by a diverse assortment of tackle that I am preparing for the next day. I’m like child that dumped its toy basket and is trying to play with everything at once. Eventually I narrow down my favorites and clean up the rest but not without some serious thought. When every day of fishing is different from the day before I must also think different to keep up with every change. Easier said than done. Despite the complicated nature of spring fishing patterns there is a method to my madness with regards to my approach each day. You shouldn’t let yesterday blind you from seeing what is directly in front of your eyes at the present. I think that can be said for many aspects of life but it is especially true for fishing. A slight change in any weather or hydrology can make fish stop feeding in one area and begin feeding in another like a light switch turning off and on. This seems to be the case for much of the spring so even if you caught fish in one particular location at a certain time with a certain technique you shouldn’t count on it working for long. Maybe next year with similar conditions? Take note. Wind direction shifted from north to south, tide came up six inches overnight: Want to make me a bet? Appropriate strategy is always a gamble when it comes to fishing but refining your game can put you ahead of the fish in terms of odds. This is my job and Id’ like to think that I have mastered it but even the best poker players loose. There are days that still leave me baffled as to why I’m not catching or why I caught fish the way that I did. Fishing is very similar to poker because you have basic strategy. Assuming that you understand basic strategy and play by the rules your odds of success are at their best. Mother Nature is the dealer like in a game of blackjack and she throws down something extreme like low tides and high winds; dealer shows an ace if you will. What should you do? Purchase insurance; fill your gas tank, take multiple types of baits and be ready to work hard because the house could win. With any luck there isn’t a jack sitting beneath the unturned card but at least you’re prepared. I play by basic strategy every day that I fish but it also pays to bend the rules sometimes. Sometimes different or new is the answer to fishing success. I have had days where after stubbornly playing by the rules for most of the day, the only bite that I have had is from a mosquito. Stick to basic strategy or break free and make a risky bet? Probably not a good idea in a casino but on the water your only loss is time wasted especially when you’re considering eating your bait for dinner because you don’t have a fish in the box. Fishing a location differently or using unconventional techniques when nothing else is working can lead to successful fishing from time to time. Forget about what you know and learn something new. Even if it doesn’t work you can learn from the mistake and every once in a while different or new does work, ultimately making you a better fisherman. With all of this said it’s time to for me to lay out some basic strategy. It’s impossible for me to describe each scenario as they are endless but there are a few factors that you should keep in mind during the spring. The first is wind. North, south, east, west, heavy or light. In the spring along the Texas Gulf Coast there tends to be lots of heavy wind. It’s not uncommon for me to fish in sustained winds of 20 to 30 mph. I tend to focus on redfish and drum with heavy wind because they feed best in response to turbulent off colored waters. On the other hand, in light winds I focus primarily on speckled trout because they feed best in response to calmer conditions. Determining what you fish for in the spring is the first step. Allow the conditions to describe the possibilities to you. Once you have determined what species you should target it’s time to focus on where. By combining the wind with tide level your search for fishing locations begins to narrow. Where can you go and where can the fish go based on tide and wind? Let’s assume my least favorite scenario, Mother Nature dealt the ace, high wind and low tide. Scratch off trout because of high wind, focus on reds and drum. They have a tendency to always stay shallow regardless of tide level. Reds and drum are forced into cuts, guts, and depressions sometimes even becoming trapped. The trick is getting to these locations in a boat and sometimes wade fishing into them is the answer. Let’s assume the opposite, high tides and light wind. I tend to scratch off reds and drum and focus on the fair weather trout on flooded shorelines and mid-bay reefs. Allow the wind and tide to help you determine location with respect to species. As mentioned before spring is a time of change and this includes fish diet. Determining what bait or lure to use is another important factor to consider. 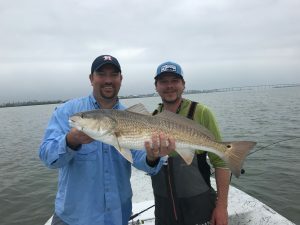 During the spring to summer transition as water temperature warms, redfish will tend to shift their diet away from shrimp to bait fish such as mullet, perch and sometimes croaker. The same goes for trout as they shift from shrimp to mullet, croaker and perch. The bait or lure you choose should mimic what they are feeding on. Easier said than done when every day is different. I personally use live shrimp for trout until the average size of croaker becomes 3-4 inches long consistently. For reds I gradually transition from shrimp to cut and live mullet as the water warms. Cut shad, cut perch and sea lice (mantis shrimp) are also popular spring time baits for reds and some days I take multiple types. Just as quickly as conditions change so does diet, so don’t forget to purchase your insurance. Change is always occurring. Still surrounded by my spilt box of fishing toys I look at the Dr. Seuss like half trees that somehow survived hurricane Harvey and sprouted branches with leaves growing in mysterious directions. An ominous and ghostly whistling sound sings to me from beneath the tiny gap under my door telling me that the wind has begun to shift from north to east and soon to south. A humming bird landed on the tip of my fishing pole the other day in the middle of San Antonio bay. It’s not often that you see a humming bird stop flying, and to land on the tip of my fishing pole surrounded by dead calm glassy water… An omen maybe? If nothing else it was a beautiful sight and we caught fish shortly after. We were fortunate enough to play our cards right that day; basic strategy with some modification did the trick. I will clean up my mess for now but I’m sure that tomorrow will lead to another as everything changes again. Thus far, 2018 has been a great year for fishing. Over the next few month’s speckled trout, redfish, drum and flounder will occupy the spotlight but many other species rest backstage. Sharks, kingfish, cobia, Jacks and snapper are all possibilities as summer approaches. I’m truly blessed to share my passion with others and look forward to the coming months. Whether you are interested in learning, or just relaxing and having a good time while catching some fish give me a shout! 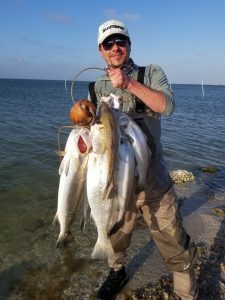 February marks the beginning of what I consider speckled trout season in Rockport Texas. Air temperatures reach close to 80 F on some days in the dead of winter, slowly warming the frigid shallows. Large trout use this optimal warming trend, combined with spring rains to reap the benefits of perfect spawning conditions. Trout spawn year-round despite popular belief but peak season is late winter to early summer when conditions promote optimal survival rates. In response to reproductive urges, large female trout tend to eat opportunistically in order to provide appropriate nutrition for their young. Forgive me for being blunt ladies and gents, but if you are pregnant you eat differently by second nature; your body craves certain foods that most likely benefits your child. Fish are not that different from humans with respect to natural urges; twitch, twitch, pause… Smack pop, tension, hookset, bent rod, drag screaming. Maybe this is the one? The one I speak of is the largest speckled trout of my life. I’m always searching for her. I remember my personal best, and many that would rest just beneath her shadow had I not released them. What fuels my desire is finding the one again. Unfortunately, for a trout fisherman on the Texas Gulf Coast the one becomes larger with each personal best. Chasing my own shadow might seem just as productive at times but every once in a while the trout makes a crucial mistake whereas the shadow does not. That is my only advantage; one mistake. Finding that perfect spot at the perfect time under perfect conditions is what I’m always searching for and it’s not something easily found. Paying attention to every meticulous detail will point you in the right direction. I actually prefer to scratch off areas that I will avoid and focus on the small percentage of water that holds hungry fish. 90 % of the fish live in 10 % of the water. Do the math, eliminate most of the bad water and focus on the 10 % that you think holds fish. Your chances of success increase dramatically through process of elimination. Easier said than done but using simple logic can take you a long ways. Let me explain. Let’s assume the wind speed is 15 to 20 miles per hour out of the north; scratch off most, but not all unprotected windward shorelines and mid bay reefs where water is the color of chocolate milk with heavy chop. This already eliminates possibly 50% of the bay. You can assume that the tide will be going out or lower than mean level with north winds so also scratch off where you, your boat and the fish can’t go within the 50% of the bay available. I’d say that we’ve knocked off another 10% of dead water leaving us with 40% to work with. The ultimate goal is to find that magic 10% of water. Let’s try to narrow our search for fish to even better odds. Timing is crucial. The water temperature has dropped with the passing cold front so the fish might be a little cold first thing in the morning. Plus there’s supposed to be some afternoon sun with the highest temperatures of the day around 3:00 pm. While inspecting the solar/lunar calendar for feeding times, a descent bite occurs at 5:00 pm. It takes a significant amount of time for air to warm water but two hours of direct sunlight can change the water temperature by a few degrees and sometimes that’s all it takes. Knowing when to be in the right spot at the right time is crucial. I’d say we’ve knocked off another 10% with consideration to timing and location. 20% of the possibilities are still available before narrowing this down to the magic 10%. This is where your eyes and mind narrow down the odds even further with impeccable precision. Understanding how to “read the water” isn’t well represented with respect to this last 20%. Your ability to read the water will ultimately dictate how successful you are any day. All patterns and variations of patterns must be considered and at times this is daunting. The best approach is to cycle through what you know works best. Start with your favorite lures and set aside (but don’t forget) the ones that don’t make sense to you based on conditions. It’s been cold; scratch top waters but don’t forget about them late in the day when your fingers hit the water and it feels warm. Reading the water is an art and in my opinion art is never perfected. Art always has flaws but this is what makes it unique. Not a bite. You decide to change to a top water from a plastic when your fingers hit the water and it feels strangely warm. Despite setting that type of lure aside earlier in the day, because it was cold and your logic told you to do so, you didn’t forget about it. At first you work the top water slow because it’s been cold; twitch, pause, twitch, pause, twitch, twitch and repeat. Still nothing. Second cast, new variation, it’s become warmer; twitch, twitch, pause, twitch, twitch, twitch, POW! Tension, hookset, bent rod, drag screaming! This is art. It wasn’t perfect to begin with, it wasn’t in the end, it had flaws but I am satisfied looking back at that moment because I found that 10%. Understanding lure patterns with regards to conditions is another fishing art. Take a lure and place it in the water. Does it look out of place? Take into account how natural it looks. You should be able to see it but if it resembles a real live bait, it should also disappear fairly quickly as it sinks or blend into the surface as it floats. Many vibrant colors exist for lures and some can pay off in extreme conditions but most of the time, mimicking the actual bait present combined with a little pizazz such as sparkle, hints of bright colors, large eyes, and some sound is a solid approach to lure selection. You want your lure to look like the bait, only slightly more appealing. The best approach is to think like the fish; once again, easier said than done. Let’s sets aside the last scenario (but don’t forget about it!) and build a new one. Full moon, midnight, water temperature warm, light ripple on the water, bait jumping, wade fishing and your goal is large trout. One of my first choices for lure selection would be the obnoxious looking top water painted black with a chartreuse head. During the day this looks unnatural but at night, from the perspective of a fish, the black silhouette combined with the chartreus head stands out slightly better than the rest of the bait. Despite this lure appearing obnoxious and out of place during one time of day doesn’t mean that it won’t pay off in the dead of night. Imagine yourself as the fish. Would you eat it? Think like the enemy in order to defeat it. Thinking is just as important as execution; they both rely upon each other in terms of success. Thinking outside the box, or should I say, ‘out of your mind and in the fish’s mind’ is the most important strategy any angler can possess. This might sound vague but it’s the foundation of fishing strategy. Many people ask me, “What do you do on your days off?” My best response is, “I fix all the broken things and then I go fishing.” They scratch their heads mostly about the fishing part. Essentially, I like to work on my days off. I’m always chasing the one and if you are serious about catching it, there is no better way than through the process of trial and error. Get out and fish! Make some mistakes; the only real mistake is the one from which we learn nothing. Today is my day off and as of this moment I am done fixing broken things. I think you know what comes next for me. The winds are light, the tide is high and the sun is setting. Sometimes life has the ability to scar. Thinking back, I can remember many events in life that have drawn blood. Sometimes the blood drips and a few days later the scar heals but other times the blood drips and the scar takes months or years to heal. The devastation that Hurricane Harvey unleashed upon the Texas Gulf Coast has undoubtedly drawn blood from myself and just about everyone I know. The scars left will take a longtime to heal; some fast, some slow but some permanent. All scars are life changing events regardless of if they disappear. If nothing ells, I might remember the initial pain after infliction but over time that pain is dulled and diluted with other pains, prides, triumphs, failures, wins and losses… Life goes on. Someday I will look back at all of my scars and the one inflicted by hurricane Harvey will be pronounced; one that healed but never quite disappeared. I will spare you the details of my specific experience because those are a dime a dozen. I will sum up the impact of Harvey with a few words; destruction, revival and resilience. Destruction not only encompasses the physical damage that Harvey inflicted but also the mental. The daily routine of individuals to multi generation old gatherings in the heart of the Texas coast will be forever changed. Yes, I said changed; but not forgotten or revived. The memories of places like Rockport are what we hold true to heart. These memories are the fuel driving their survival. Whether it be, “The charm of the Texas coast” or “A sleepy little drinking village with a fishing problem”, I will remember it as my life. I’m not about to let the sublime dreamy ambiance of such a place wash away. It’s my life… I decide. Revival: An improvement in the strength or condition of something. As a marine ecologist by degree, and fishing guide by heart, I believe that hurricane Harvey flushed and cleaned the ecosystem surrounding Rockport Texas like nothing seen in decades. It’s difficult to look at the terrestrial landscape and also understand that the marine environment benefits from such destructive forces. As one environment is destroyed another is created. Freshwater inflow and a “flushing” process is important for the long term survival of the saltwater ecosystems. New structures such as sandbars, cuts, wrecks and debris will provide structure and habitat in the years to come. I am visiting this new post hurricane habitat at a regular basis for work and pleasure. It hasn’t been easy but this leads me to my next word: Resilience. Resilience: The capacity to recover quickly from difficulties. I’ve seen a thing, or two, or three that have left my mouth agape over the past few years with Harvey the latest. It hasn’t been easy dragging out my boat that survived. Initially, I felt guilty while fishing because so many people were still trying to find their shoes. I’ve seen a few float by over the days and I wonder where they came from and who they belonged to. On one such occasion my lost sandal train of thought was interrupted by my rod bending and my drag screaming. The rate at which my drag screamed was equivalent to that of my pulse. I had forgotten the feeling of that thrill, and it didn’t take long to justify my initial guilt with remorse. I had forgotten who I was and I hate to forget, especially my own identity… But I remembered. Just a little over a month after Harvey, I found myself drifting the flats of Redfish bay with my father. The destruction that we drove by on the way to the boat ramp was lingering as we passed more on the water further solidifying the idea that we were going fishing one month after a category four storm ravaged the area. Only once the horizon was a distant blur and the only thing we could see was fishy looking water did we forget about what we had just seen. I think it was the second my father’s drag first screamed that I realized not much had changed on the water and it left me with an ear to ear grin that almost fractured my face. From that moment on, we caught fish, talked and remembered. Memories drifted to and from myself and my father as we drifted the flats with lures. Everything from the one eyed state record pin perch “Moses” that we caught years ago to scientific studies of cats being thrown off of buildings to see if they’d land feet up were topics of conversation. It was nice catching some fish but it didn’t matter because I remembered…I found myself. A few beers later, a stomach full of redfish, ironically Bob Dylan – Hurricane, and pops sound asleep snoring to the old tune; I write this. Enough with the jibber jabber, what’s up with the fishing in the aftermath of a cat 4 hurricane? Truth be told I’m becoming more and more excited each time I go out. Monster high tides not associated with Harvey and the occasional cool front have pushed fish into areas that are sometimes inaccessible. A tremendous lack of reliable bait sources has left my shoulder tired from cast netting and my fingers slick from the oily scent of many soft plastics. Both plastics and dead bait such as cut mullet and dead shrimp have been productive. Let the water determine your style. Sometimes live croaker and live piggy perch are available but based on the current environmental factors and availability of bait to purchase I will be using lures, live shrimp, dead shrimp, cut mullet, and anything else that I can get my hands on. A box of your favorite lures, dead shrimp and cut mullet can take you a long ways on a good day right know. Don’t forget your cast net! As always the presence of bait fish in a given area is never something that you should pass up. Rafts of nervous mullet, jumping shrimp, flipping shad, mud boils, v- shaped wakes, and slicks are all giveaways when locating fish. The water quality is also very important in the wake of the storm. There’s lots of fresh water and flood water mixing with gulf water thus creating a full spectrum of hydrological scenarios. Don’t pass up the obvious signs even if the water looks off colored. Most of the saltwater species that I target inshore have the ability to thrive in what some might consider less than desirable conditions. One of my friends caught redfish in water that he described as black a few days ago. Don’t let the reverie of turquoise green water blind you from the truth. The bays are still flushing with each lunar cycle and hydrology is constantly changing for the better with each flood and ebb tide. The fish have to deal with the same mess underwater as we do on land; rarely do I forget to eat. Today was one occasion that I almost forgot to eat. I took a long time customer out, just himself and I. From 8:00 am -2:00 pm I never had a chance to eat my full lunch. Each time I started to eat, one of our rods was bent with a fish on the end. I found myself eating the last of my lunch once I got home. I stare out of my window now remembering today, even though it’s not over. This is why I do what I do; it makes me happy. Tonight I will dream and hope for another day like today. For now I will forget about the “H words”, those are in the past for now. I will continue to pursue my dreams as I’m not about to let a storm blow them away. When I get sad or frustrated with life my therapy rests only a few feet away from me in the form of a rod and reel. Maybe it’s time for you to forget about the turmoil of life? Just give me a call and come on down to Rockport, Texas; I didn’t blow away and neither did the fish. Be courageous and stay strong! 2016 was a very busy year for me and I am truly blessed and thankful for that. In life, we all encounter many twists and turns. Last year was full of steep grades, sharp turns, and unexpected potholes, most of which had nothing to do with fishing. I found myself questioning every choice I had made in life. It was a bumpy road but good thing I had heavy tread on my tires. It wasn’t the first time I had encountered difficult times. What hurts makes you stronger in the end and I can attest to that. I found a few things very helpful on my journey; friends, family and fishing. Friends and family was obvious but fishing was the supplement that ultimately wove my life back together. When I combined it with friends and family, I began to find myself again. I wasn’t sure if I wanted to go but I force myself to. Regardless of my situation, I wasn’t about to turn down a kayaking trip down the Medina River with some of my closest friends. It had been a long time since this was even possible due to the record long Texas drought that reduced river water levels to a trickle so I borrowed a kayak, grabbed my ultralight, a few good lures and a few cold ones. I met my friends at the old river crossing that we always launched from years ago, and we paddled away in reverie. To my surprise only moments after leaving, I found myself chatting, laughing and casting during my darkest time. Holding a beautiful Guadeloupe bass in my hands was as good as holding my lost soul. I’ll never forget the day or those moments. The simple message is; fishing can help and fishing can heal. Fishing brings friends and family together, it takes the mind away for the obvious and it can truly help the troubled mind. After that day, I found myself fishing with friends and family every second I could and each time was healing. I was able to find purpose that otherwise wouldn’t exist and to this day, I find myself fishing with family and friends. Sometimes we catch fish, sometimes we don’t, and sometimes we don’t even fish when going fishing. I have learned that catching fish is a bonus, what matters is each moment in time. When life has long expired, it’s the moments that we will remember, if we happen to be holding fish… Even better. I’m happy and smiling just writing about it. With respect to what you have already read, my focus in writing this is not technical aspects; you can read that anywhere. 2016 has allowed me to focus on what’s important if life. For me, fishing definitely falls within that realm so I’ll briefly cover what’s important. A few specific events have occurred over the past few years that have helped fish population tremendously; rain, Cedar Bayou and trout limit reduction. I’ll briefly touch base on each of those. The rain: In 2015, the coastal bend as well as most of Texas received the “drought buster rains” needed to allow the rivers flow. Fresh water is a crucial component to the productivity of salt water ecosystems. This rainfall event essentially seeded the bay with the components required for sea grass growth and productive spawning for everything from shrimp to fish. Crab and shrimp populations exploded in response to the fresh water and increased habitat in terms of sea grass. The large keeper fish of every species migrated toward the abundance of bait and habitat; so, I took advantage. Last spring was epic in terms of large quality trout. I didn’t see many fish considered to be true trophies but I found a ridiculous abundance that made my heart skip a beat when they broke the surface. I’m talking about 23-27-inch trout, …. Nice one for sure. Cedar Bayou: September 5th 2014, marked the long-awaited opening of Cedar Bayou. Long awaited, you might be asking why? I’m speaking historically on the account of a few fishing guides that pioneered the fishing guide business in Rockport, Texas during the 1950’s and 1960’s. I have known them personally and I consider myself an apprentice to their knowledge as I have worked under them. The old salts referred to Cedar Bayou as the “mecca” of the Texas Coast. Cedar Bayou had been closed since I was eight years old so I never had the chance to experience the legends until 2014. Picture a saltwater river winding through sand dunes, 20 miles away from any civilization. It is the only pass on the Texas coast that remains open today, without jetties. Despite rumors of it silting in, I can attest to the fact that it’s open. I learned over the past few years that the legends were not myth. Id’ be humble saying that my greatest day of wade fishing for reds ever, occurred in Cedar Bayou a few months back. Redfish are not the only species that utilize the cut. Every species in terms of inshore and nearshore benefit from the hydrology. Reduction of speckled trout limit: A 3% to 27% harvest reduction of spotted sea trout, dependent upon two categories (guided vs guided) was reported along the Texas coast after the bag limit reduction from 10 to 5 on September 1, 2015. I don’t second guess the data collected because it was my job during my internship with TP&W during college. I don’t second guess the data collected based on my experience as a fishing guide because I see the results daily. Not only have I caught larger trout but I caught more numbers during times that I normally don’t focus on trout. Over the past two years, trout fishing has always been an option vs forgetting about them during the typical down time for trout. With conditions, aside, if I could fish for trout I would and I caught them well year-round. In life, at the end looking back, I’ll probably have many memories; some good and some bad. To this day, I can’t remember a truly bad day of fishing even if a fish hook had dug deep into my flesh past the barb. That type of memory and pain is subtle compared to other pains in life. I look back in the past with my friends and we laugh at the worst days of fishing while I think quietly alone at the worst days of my life. The memories of the worst days of fishing combined with the best, overshadow and heal everything that has happened in life. Hopefully tonight I dream of fish and if I do, I’ll sleep well and be ready for another day of fishing. Imagine spending your fishing vacation stress and worry free. You don’t have to wonder where to fish, how to catch fish or worry if you have the appropriate equipment. Why not let a professional take care of that part? 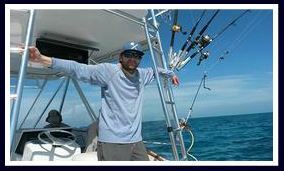 With 10 years of experience and a Bachelor’s degree in Marine Ecology, I will provide you with the knowledge and experience you need for a successful fishing trip. I am an expert of all types and styles of fishing. Regardless of age, or experience, I am fully prepared for all types of clientele. If you are looking to relax and have a good time fishing without the stress, worry and work, feel free to contact me.